Major sporting associations have come together to launch a Mental Health Charter for Sport, which aims to tackle the stigma around mental health. The Charter aims to tackle mental health stigma by using the power of sport and recreation, emphasise the benefits an active lifestyle brings to mental health and wellbeing and to encourage the wider sector to showcase best practice and to make progress in tackling issues around mental health. It was developed in partnership by the Professional Players Federation (PPF), the Sport and Recreation Alliance, the Football Association (FA) and mental health charity Mind. The country's biggest sports governing bodies, including the FA, Lawn Tennis Association, Rugby Football Union, England and Wales Cricket Board and UK Athletics, have already signed-up as well as professional player associations including the Professional Footballers’ Association, Rugby Players’ Association and Professional Cricketers’ Association. Mental health is becoming more of an open issue in professional sport. For instance, for the past three years the number of cricketers seeking help for mental health-related issues has doubled year-on-year. During the same period, the PPF has doubled the number of counsellors for footballers due to an increasing demand. 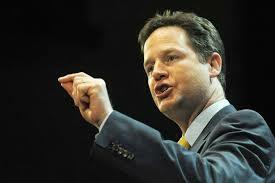 Deputy Prime Minister, Nick Clegg (pictured), who helped to launch the Charter, added: “Whether it’s Wimbledon or the World Cup, the Olympics or the Open, we are a nation truly inspired by our sportsmen and women. “But with one in four of us affected by mental illness in any year, we know that professional sportspeople are not immune. Out of the spotlight and away from the glare of the media, some have been fighting their own personal battles against mental illness. Last year Mind published a report which found that professional athletes struggle in silence because for fear that asking for help with a mental health problem will negatively affect their careers. Mind’s report called on professional sports clubs, governing bodies and community organisations to forge closer working relationships as part of a pan-sport mental health network. Mind will consult with signatories of the Mental Health Charter for Sport and Recreation to help them build mental health awareness into their strategies and offer strategic advice on influencing and engaging key stakeholders. Paul Farmer, chief executive of Mind, added: “From the elite level down to grassroots – sport can be used to reduce stigma and encourage positive conversation about mental health, which is why we’re delighted to back the Mental Health Charter for Sport and Recreation.